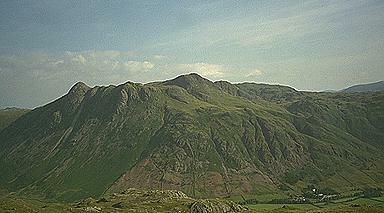 From the top of Redacre, not from the summit, the three Langdale Pikes are seen, Pike o'Stickle, Loft Crag and Harrison Stickle. Pavey Ark is to their right. Middle Fell Farm and the Old Dungeon Ghyll Hotel can be seen, bottom right. Larger version of this picture.